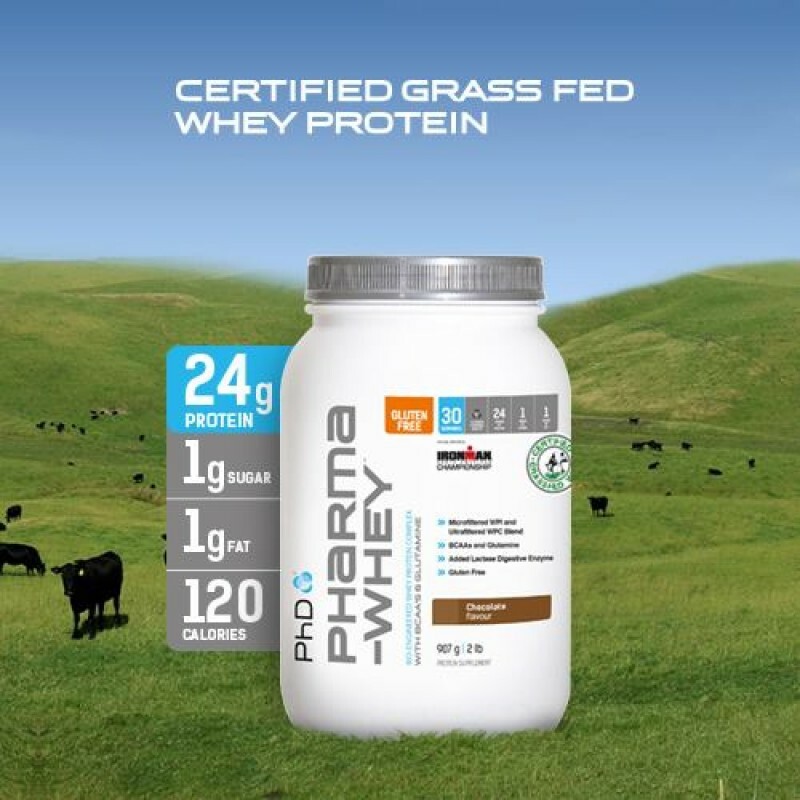 Pharma Whey By PHD Nutrition | 100% Certified Grass Fed Whey Protein. Pharma Whey By PHD Nutrition It’s what you've been waiting for, hormone & anti-biotic free, 100% certified grass fed whey protein! New to the Australian market, PharmaWhey by PhD offers you an incredible gold star, high-quality protein, at the cost of regular standard whey! Containing 24g protein, 1g fat & 3g carbs per serve, PharmaWhey is gluten-free & naturally high in BCAAs & glutamine. Superior quality at a low cost; You can’t say no! Available in 2lb & 5lb in Chocolate, Vanilla & Banana. PhD Pharma-Whey is comprised of a unique protein blend to produce one of the finest Whey Protein formulations available. Pharma-Whey does not contain any added carbohydrates and contains 82% protein, making it one of the leading proteins on the market. Pharma-Whey possesses a uniquely high bioavailability providing an ideal source of protein for all athletes seeking purity, performance and appearance . Grassfed whey protein full of biologically active microfractions and lactoferrins. 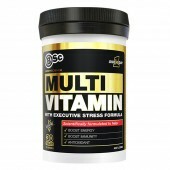 Provides protein for the support of muscle synthesis. Anybody with an inadequate diet or low intake of protein. Anybody looking for a performance edge. Anybody looking to increase protein intake on a calorie restricted diet. 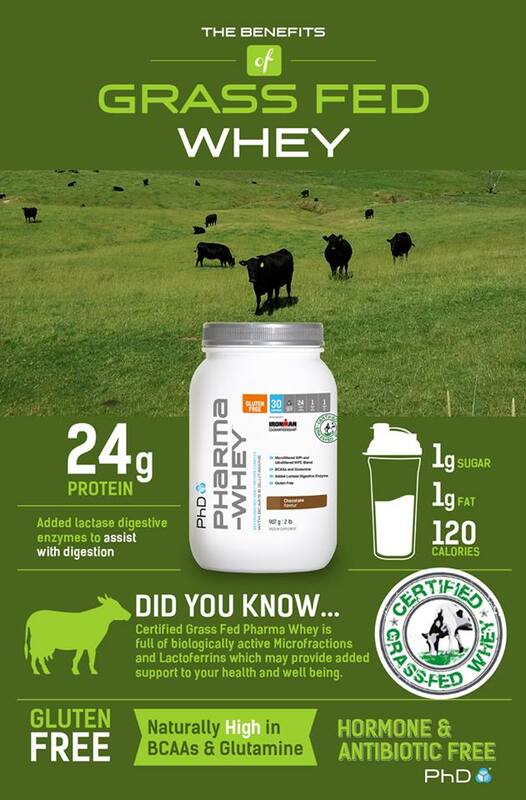 There are many benefits of making grass fed whey your protein supplement of choice. Here’s some information put together from the Journal of Medicinal Food & Journal of Animal Science. Happy learning! Milk is nature’s perfect food. It’s the way a mother supports development and health of her new born baby. There is not a time in our lives when we grow as fast as we do when we are feed from our mother’s milk. Cow’s milk is no different. It’s found that Grass Fed animals are healthier, stronger, and more nutritious. 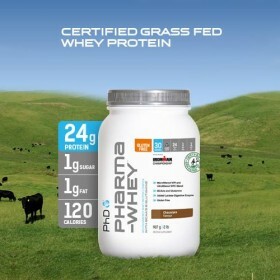 Grass Fed whey contains more immune stimulating compounds which keep you healthy and disease free. It will also assist in adding quality absorbable protein to your diet. It’s been found that grass fed cows produce whey that will boost your glutathione levels fed. This boost in Glutathione (Master Antioxidant) can have a profound benefit on your health. It may reduce inflammation (which leads to most diseases and a dysfunctional metabolism) and improve your ability to cleanse your system from compounds that may be disrupting your endocrine (hormonal) system. By feeding the cows pesticide-free and chemical-free fresh grass instead of grains, the whey stays free from hormone disrupting chemicals. Since the cows aren't treated with antibiotics or rBGH, they produce stronger immune supporting compounds which are transferred into the whey. The result is potent, high quality whey designed to keep you healthy, lean, focused, and strong.